What is the meaning of photo rejuvenation? 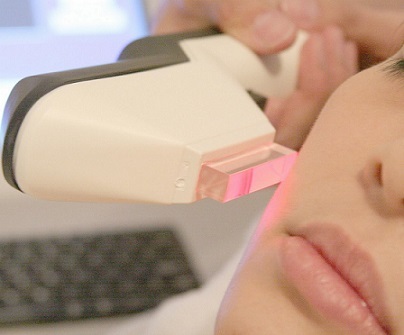 It is a type of skin rejuvenation in which intense pulsed light (IPL) is used. This light is absorbed by red as well as brown pigments present in the skin. The energy of IPL gets delivered to epidermis and also dermis layer but there is no damage caused to epidermis or the superficial layer since a chilled crystal remains in contact with the skin and prevents any damage. Therefore there is practically no downtime with this skin photo rejuvenation treatment. Which areas are treated using this treatment? Normally, this treatment is used for areas such as face, hands, chest, neck and shoulders. Yes but it is not a cure for the problem. This therapy can significantly improve Rosacea’s symptoms covering inflammatory acne, enlarged pores and excessive flushing. Results are clearly visible after a few sessions of this treatment. Prior to the treatment, your doctor will apply a cold gel over the treatment area and you will be provided with protective eyewear. Afterwards, bright pulses of intense pulsed light will be delivered over skin surface to cover the whole area being treated. How much time procedure takes? Each of the sessions is normally of 30 to 45 minute duration. After the session is over you will experience warm feeling over the treated location but that would subside within a short period of time and you can head back to doing your normal tasks almost immediately. Immediately after the session is over, you will see mild redness in the area which normally goes off after some hours. Brown spots will also darken but in a couple of days these dark spots will develop flaky cover and gradually shed to reveal the new fresh skin. Generally 5 sessions are required which are spaced at an interval of 3 weeks. However, number of sessions required may vary from person to person and how many sessions you will require will be decided during the preliminary consultation. If you use good sun protection cream such as SPF 30 with a well planned skincare routine then the results will last for several years. However, you need to understand that skin damage you see are due to prolonged sun exposure over the years and its manifestation in the form of brown spots or enlarged pores will continue. For these reasons, you may require maintenance treatment at an interval of every three to four months or one year, depending upon your particular situation. Which precautions are necessary while procedure is on? At the time your photo rejuvenation sessions are in process, avoid sun baths (tanning) as during this time the skin is more vulnerable to reactions from intense light. What side effects I should be aware of? There are generally very few side effects such as redness in the area where pulsed light is applied. In very rare situation there would be side effects like formation of blisters in the area.